Kauri dieback disease is having a devastating effect on our giants of the forest. 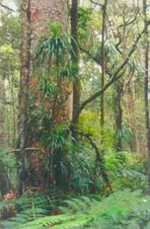 Once kauri trees are infected,they will die because there is no known treatment. The turn-off for Trounson Kauri Park (573 hectares) is 32 km north of Dargaville. There is an easy half-hour walk leading from the parking and picnic area by the road, passing through beautiful forest with streams and some fine kauri stands, a couple of fallen kauri trees and the Four Sisters - two trees each with two trunks. There is a ranger station and camping in the park. Guided night-time nature walks are organised in the area. These excellent, informative walks are reasonably priced and the guide will explain the flora and nightlife. You might even see a kiwi if you are lucky. The Department of Conservation's Northland Conservancy held a celebration on 24th May 1998 to mark the anniversary of this region's first mainland island site. DOC are extremely pleased with their success in being able to remove many of the pests and predators in the park, allowing the recovery of native trees, plants and animals. With the removal of most of the possums and rats, and large numbers of stoats, weasels, ferrets, cats, the kukupa (pigeon) is recording an increase in numbers (around 86) and Trounson has become one of the best kiwi (thought to be around 200) breeding sites in New Zealand. The park has also undertaken the first reintroduction of North Island robins to a mainland site. Similar principles that have been used by DOC on offshore islands - clearing the environmental nasties and being off-limit to the public have been used at Trounson. Re-invasion of pests is always a problem on mainland projects, but because Trounson is relatively isolated and has no large browsing animals like pig, goats and deer, it is more easily controlled. Already home to threatened species such as brown kiwi, kukupa, pekapeka (bats) banded kokopu and kauri snails, the area has potential for the re-introduction of other threatened species such as the robin, kokako, rifleman, Hochstetters frog, lizards, invertebrates and plants like mistletoe. The reserve includes apart from kauri, a number of fruiting species like taraire, tawa, kohekohe, pidgeon wood and podocarps. Its clear water streams are home to koura, (crayfish) and native fish-like banded kokopu. When it was realised that the forestry industry at the time threatened to destroy large areas of Kauri forest, a 3.34 hectare area was set aside by the Government in 1890. Early in the century James Trounson gave 22 hectares to what was already set aside, and later sold another 364 hectares of forest to the Government. In 1978, 13 adjoining hectares of regenerated kauri was donated by Mr E. A. Wrigley, making Trounson Park one of the finest forest stands in the world. Trounson Kauri Park is providing valuable information and opportunities for our, and future generations, to leave the environment in an excellent condition.